For the first time, our group will be participating in this event! Enjoy a fantastic afternoon with your furry, four-legged friend, at the Frederick County Parks and Recreation annual Bark in the Park. Our group will be present to discuss greyhounds and what great pets they make! We will have greyhounds looking for their forever homes; come on out and meet them! We will also be vending and we have lots of great items for your dogs (any breed!)! Your pooch will have an opportunity to run free in one of our off-leash areas, test and sharpen his or her skills on the agility course, participate in doggie contests, and make new friends. 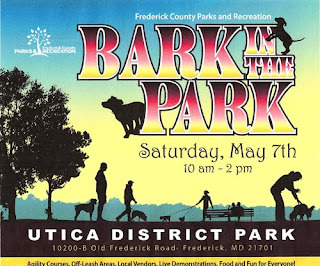 Bark in the Park also provides great opportunities for families to adopt a dog, learn different training techniques, sample dog-related products, and visit exhibit booths. This event is sure to be a dog-gone good time! Beat the rush by pre-registering now or you can register on site the day of the event. Dog owners must bring a collar, leash, and proof of rabies vaccination for entry. Limit 2 dogs per owner. For information on this event, click on the title of this post. Hope to see you there!